Ashish Nehra ( pronunciation (help·info) Hindi: आशीष नेहरा; born 29 April 1979) is a former Indian cricketer who played in all formats of the game. He is often nicknamed as "'NehraJi'" by his colleagues and fans. Nehra had a career troubled with injuries and fitness issues. In an interview, he revealed that he had gone under as many as 12 surgeries. Yuvraj Singh had even once joked about this and said "Ashish Nehra is player who can get injured while sleeping too”. Due to fitness issues, he was absent from the national scene for extended stretches but was a part of the Indian team in two Cricket World Cup campaigns, two Asia Cups and three ICC Champions Trophy. He had also been particularly effective in the Indian Premier League, in which he has represented five different teams. Nehra was called "one of the best bowlers that the India national cricket team has ever seen" by Ravi Shastri. M.S. Dhoni also suggested Nehra's name as the future bowling coach for India considering his massive experience, his ability to swing the ball both ways and his ability to bowl well under pressure. Nehra announced his retirement from all forms of cricket in late 2017, with the Twenty20 International match against New Zealand on the 1st of November 2017 at Feroz Shah Kotla Ground his last appearance. Javagal Srinath, in honour of Nehra's career said, "This is the saddest retirement the sport has had to see since Sachin Tendulkar and will leave a hole that cannot be filled. His expertise, way of mentoring the team, and leading from the shadows will never be forgotten by any of the team members." On the eve of his farewell game, Delhi & District Cricket Association renamed one end of the Feroz Shah Kotla Ground as "Ashish Nehra End" and thus Nehra became the second bowler in cricket history, after James Anderson (cricketer), to have bowled from an end named after him. Nehra was the second oldest player to represent India in T20Is, at the age of 38 years 186 days, only exceeded by Rahul Dravid, who played at the age of 38 years 232 days. Nehra was born in 1979 in Delhi in Jat family to Diwan Singh Nehra and Sumitra Nehra. He has a brother Bhanu Nehra who is a restaurateur. Ashish Nehra is married to Rushma Nehra and they have two children: daughter Ariana and son Aarush. Nehra started playing first-class cricket for his hometown Nehra Nagar, Delhi, in the 1997/98 season.He played for sonnet cc. He was a student and learned cricket under directions of Mr Tarik Sinha who is still coaching in sonnet cc. However inconsistency and successive back and ankle injuries prevented him from cementing his place in the Indian team. His career statistics are better in ODI cricket than in Test cricket, but with 157 ODI wickets at an average of 31.72 his average is higher than three of his contemporary competitors for fast bowling places in the Indian team – Irfan Pathan, Zaheer Khan and Ajit Agarkar, who all had bowling averages below 30. A later crop of fast bowlers such as Munaf Patel, RP Singh and Ishant Sharma also added to his competition. 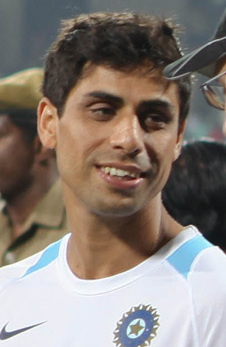 Nehra completed recovery from a bowel injury in March 2006 and tried to make a comeback into the Indian team. He recalled to the ODI squad for the tour of West Indies in June 2009 after 4 years due to an injury to Zaheer Khan. In 2011 Cricket World Cup, Nehra played his first game vs South Africa. He was expensive giving away 65 runs during 8.4 wicket-less overs. He gave away 16 runs in 4 balls when he had to defend 13 runs in the last over. After this, many thought Nehra's World cup was over. He was, however, a surprise inclusion against Pakistan in the semi-final ahead of Ravichandran Ashwin. Nehra redeemed himself by being the most economical bowler for his side taking 2 wickets in 10 overs for 33 runs as India beat Pakistan by 29 runs. He however could not play the final due to a fractured finger on his right hand. After recovering from his injury, Nehra made himself available for the 2011 ODI series in England; after being ignored, he commented that he was 'deeply hurt'. Despite the backing of former Indian bowler Manoj Prabhakar and a decent Ranji season, he was ignored for the subsequent tour of Australia as well. Recently, Nehra made a national comeback in the T20 squad for India's tour of Australia 2016, the Asia Cup and the world T20. After performing against Australia and Sri Lanka, he was promoted to India's main bowler at the age of 36. He continued his good performances into the England T20 series in 2017, taking 3 for 28 in 2nd match. Nehra played his last ever international match in a T20I against New Zealand on 1 November 2017. India won the match by 53 runs, with Nehra bowling the final over. After recovering from the ankle injury that prevented him from playing for the Delhi Ranji Team in the 2007–08 season, Nehra joined the Indian Premier League and signed up for the Mumbai Indians franchise. He won the Man of the Match for the game versus Rajasthan Royals taking three wickets on 7 May 2008. He played for the Delhi DareDevils from 2009. He was picked up by Pune Warriors India in the 2011 IPL player auction for a sum of Rs. 3.91 crores,. Nehra was ruled out of IPL-4 for first few matches due to a fractured finger on his right hand. He came back again in the IPL-5. He was swapped up with Ross Taylor to play for Delhi Daredevils in IPL 6. In the 2014 IPL auction Nehra was bought by the Chennai Super Kings for ₹2,00,00,000. His bowling skills had been showcased to its full extent in IPL 8. He took 22 wickets in 16 games at an average of 20 with an economy of 7.2, proving his worth once again and was one of the highest wicket takers in competition, only to lose to his teammate who won the purple cap; Dwayne Bravo. In the 2016 IPL auction Nehra was bought by the Sunrisers Hyderabad for ₹5,50,00,000, he went on to win the 2016 Indian Premier League. In the 2019 IPL, Ashish Nehra joined Royal Challengers Bangalore as the out of their boundary 12th man (a recently created position in cricket). In January 2018, Royal Challengers Bangalore appointed Ashish Nehra as their bowling coach. Nehra retained his position in 2019 version of IPL and proved to be fatal for the bowling of RCB especially pacers gave very poor performance under his coaching. ^ "Nehra farewell hogs headlines in T20I series opener". International Cricket Council. Retrieved 1 November 2017. ^ "Rohit, Dhawan break both records and New Zealand". ESPN Cricinfo. Retrieved 1 November 2017. ^ "Group A: Delhi v Vidarbha at Delhi, Dec 14-16, 2013 - Cricket Scorecard - ESPN Cricinfo". Retrieved 6 June 2016. ^ a b "Nehra for Mumbai Indians, Mishra for Delhi". Cricinfo. 14 March 2008. Archived from the original on 17 March 2008. Retrieved 21 April 2008. ^ cricinfo, espn. "Delhi swap Taylor for Pune's Nehra". nehra swap. Retrieved 19 February 2013. ^ "IPL 2018: Gary Kirsten, Ashish Nehra Join RCB Coaching Team". The Quint. Retrieved 30 January 2018.